WordPress eMember is a powerful WordPress Membership Plugin that can turn your existing or new WordPress site into a fully featured membership site easily. Install the plugin, follow our video tutorials and within minutes you will have your own membership site ready to go! 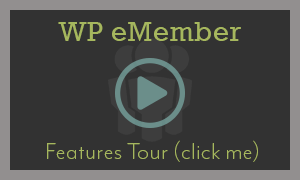 WP eMember lets you selectively protect articles by creating various membership levels (example: Free, Basic, Premium, Ultimate etc.) and protect the content (posts, pages, comments etc) of your site. The plugin manages all the membership management side of things. Best of all, we keep the plugin updated to work with the current version of WordPress, provide support to our customers and it doesn’t break when you upgrade. What is a Membership Site? A membership website will have specific content for members of the site. The content could be tutorials, videos, ebooks, digital downloads, news articles etc. Generally members have to pay a fee to become a member. It could be a one time fee or a recurring fee (billed per month/3 months/year etc) to get access to some or all of the members only content. Easy installation like any other WordPress plugin. Upload, activate, follow our video tutorials and you will be up and running within minutes. Membership signup, profile maintenance, payments, account expiry, upgrade notification, cancellation, password reset is fully automated after you setup the plugin. Selectively protect the full or a section of an article content. Create different membership levels and select what content (posts, pages, categories, comments) can be viewed by each membership level. You also have the option to bulk protect the posts, pages and categories of your site. Protecting a category will protect all posts under that category. Create “Basic”, “Premium”, “Ultimate”, or any other levels you want. Charge more for higher levels of access – all within the same WordPress site. When you buy the WP eMember plugin you can use it on as many sites as you own (you gotta love that!). There is no “Developer Option” here. One low price entitles you to use the plugin on all of your sites. View your members, membership level, account status and much more. Easily upgrade members, move them to different membership level, pause their membership, or delete them entirely. You can choose to manually approve the member accounts. There is also an option to send them an email when you approved the member account. Ability to blacklist IP addresses, email addresses or email address patterns. This can help you prevent problematic users from registering on your site. Easily protect a section or sections of a post or page to create teaser content. Only members with the correct permission can view the protected section content. How to do it is explained here. Multiple membership levels can be assigned to a member’s profile. In this setup the member will be able to access content from all the different membership levels that he has in his profile. Schedule automatic upgrade of your members from one level to the next. For example, after 30 days, you can automatically upgrade members from a “Silver” level to “Gold” level which will allow them to view the content of this new level. Set the first page your members see when they login. Even use a different redirection page for each membership level. You can customize what fields are included in the member registration form. You can also add custom registration fields to the member registration form. More details on custom registration fields can be found here. Very easy to use the plugin and it seamlessly integrates into your existing WordPress site. No site or theme redesign necessary. Your members can bookmark their favourite posts and pages on your site then view their bookmarks later. View bookmark feature details here. Ability to export all your members profile data to a CSV file. You can open the CSV file in Excel for further processing, analysis, formatting, or printing. If you offer downloads for your members then you can use the folder protection feature. Users will need to provide valid login credentials to download any file from the protected folder. Secure RSS feeds allow your members to view their membership material in their favorite RSS reader (non-members cannot access the feed). Our plugin code-base is very stable. We put a lot effort into testing and developing our plugins so it doesn’t break your site after you upgrade. Free future improvements and upgrades (there is no annual fee). You will always have access to the latest version of the plugin for free. WP eMember plugin works with https pages out of the box (useful if you are using an SSL certificate on your website). Can be easily integrated with a hosted or standard PayPal button. Both one time and subscription/recurring payments are supported. View details here. WP eMember plugin can be easily integrated with the Braintree buy now buttons (onsite checkout) to accept membership payment via Braintree gateway. WP eMember plugin can be integrated with the WooCommerce plugin to accept membership payment via WooCommerce. It can be integrated with Autoresponders (AWeber, MailChimp, GetResponse, MailPoet). This way the members automatically get signed up to your list/campaign for email marketing purpose. Can be integrated with bbPress forum plugin. This allows you to apply protection to the forum topics and replies. You can also make certain forums for members only. Can be integrated with the WordPress Affiliate Software Plugin. So if you decide to boost your membership signups by introducing an Affiliate Program later (award affiliates that redirect visitors who become your member) then all you have to do is activate the other plugin. Can be integrated with the WordPress eStore (WordPress Shopping Cart) plugin so you can create any type of payment buttons for your paid membership content. Scared of getting worthless product documentation after you purchase the product? Checkout the membership plugin documentation before you make a purchase. One of our strong features is the support we offer to our customers. We always keep the plugin updated to work with latest version of WordPress. We guarantee that software bug (if any) will be fixed within a reasonable amount of time. 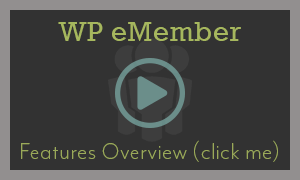 View the full list of WP eMember plugin features. You also get access to the following WP eMember addon plugins with your purchase of our WordPress membership plugin. The Members Profile Display Addon lets you display your member’s profile on a WordPress page so other visitors can view it. Easily show off your members list. Using Captcha on the registration form is a great way to stop spam signups (if you offer free user registration). This plugin has a variety of captcha options that you can use on your member registration form. This addon allows you to capture each WP eMember user signup as affiliate leads if the user was referred by an affiliate. This can be helpful if you are using our affiliate plugin. 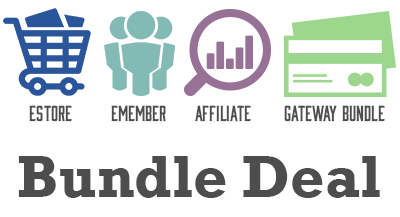 This addon gives you the ability to create pricing tables for your membership levels. You can summarize the benefits of your main membership levels and how much it costs. This addon gives you the ability to send an email broadcast to your members (all or a few selected members) from within the WordPress dashboard. If you are having any issue with this plugin then feel free to post it on the customer only support forum. Please visit the demo and the documentation page to make sure you understand the capability of this plugin. You can also watch the video tutorials. If unclear let us know and we will try to clarify it for you. We won’t waste your time with fake testimonials! Checkout the customer feedback page and see what some of our customers have to say about us. A huge shout out to the team at Tips and Tricks HQ for providing the most fantastic, easy to use, plugins for WordPress. I highly recommend WP eMember product – simply awesome! You can also check the comment section below for more customer feedback. See the Products page for more bundled product deals. Yes all our plugins work with PHP 7+. it’s working on PHP 7.1 version? Hi. I have a support page on my website. If my costumer buy product A,B or C; he has access this support page for 30 days. Now. Let’s say my client bought the product A. Let’s say that he bought the product B, 15 days after the purchase of the product A. In this case, he has a total of 45 days access to my support page. Is it possible to set this in the membership settings? @Albert, Yes all our plugins are kept updated to work with the latest version of WordPress. Does this plugin work with WordPress 5.0? @Lannie, Yes you can set a trial period for as long as you need to there is no time limit on how long you can have a trial period for. You can also generate reports for members that have canceled by a specific time period. Can I set a trial period for say 6 months? I need a trail period for one of my memberships to be 6 months. Is there a time limit to how long a trial period can be? Also can I generate a report of expired members based on a time frame. For example the last 3 or 6 months? @Loida, Yes this plugin allows you to charge one time or recurring payment for membership access. The following tutorial shows how you can create a one time payment button to charge once for your membership access. You can set any duration the membership should be active for. In your case, you will set it to no expiry so they have access to it forever after they purchase it. I want to buy this plugin but not sure if it will work for what I want to do. I want to sell a 6 week course, so obviously, this course content needs to be protected so that only people that paid for it can view it when logged in. I know this plugin can help with that, however, I won’t be charging a monthly membership fee. It would just be a one time payment so that they have access to this course forever. Does this plugin give the option of only making a one time payment instead of recurring payments? Very good support and great plugin! @carlene, yeah they can renew anytime. The extra time will be added to their membership. Also can I change expire dates. I give away free time. @Bruce, Yes the eMember does use the latest Clickbank IPN. I would like to know if your plugin uses the latest version of the Clickbank IPN? Your plugins are so much better than many/most of the other options on the market. I’m glad I found this site a few years ago. The support has been great, too! It is amazing how you have added so many features in such a compact form. I am loving the support and the documentation. View our WordPress plugin collection and start using them on your site.